What are the specifications of the Razer Core X? Razer Blade Stealth, Razer Blade, and Razer Blade Pro laptops with Thunderbolt 3. Additional laptops require a Thunderbolt 3 port with external graphics support. Please check with your laptop manufacture to confirm if your laptop supports external graphics. See following graphics card compatibility list for Windows 10 and macOS devices. Weight 6.48 kg / 14.29 lbs. 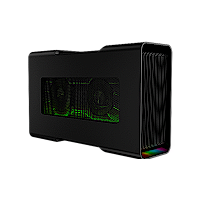 Does the Razer Core X feature Chroma lighting? No, the Core X does not feature any type of Chroma or other lighting. 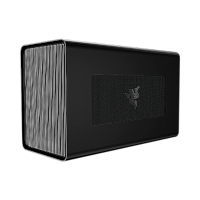 Is the Razer Core X supported by Synapse 3? Yes, it will be recognized in Synapse 3. However, there are no user setting or adjustments for the Core X within Synapse 3. How much does the Razer Core X cost? 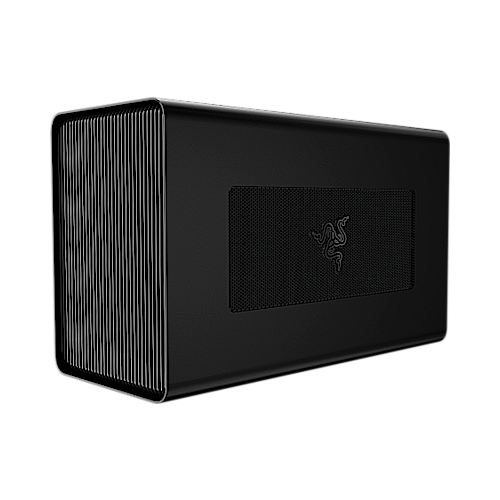 What countries is the Razer Core X available? The Core X will be available in United States, Canada, United Kingdom, France, Germany, Nordics, China, Australia, Hong Kong, Japan, Singapore, and Taiwan. What is the main difference between Razer Core X and the Razer Core and Core V2 versions? Get the ultimate graphics boost with the Razer Core X, equipped with 650W power supply and up to 3-slot wide cards, or choose a more compact form-factor with Razer Core V2 and its desktop-class setup featuring 4 USB ports, Ethernet, and Razer Chroma lighting to sync with your gaming peripherals. The Core X has a power switch located on the backside near the power cable that is not featured in the Core V2. Is a Thunderbolt Cable included with the Core X and how long is it? Yes, a .5-meter Thunderbolt Cable is included with the Core X. What GPUs are supported by the Core X? Does the Razer Core X / Core V2 work with a Mac? Yes, they are compatible with Thunderbolt 3 Macs running macOS High Sierra 10.13.4 or later and requires a compatible AMD graphics card. Ple ase note that Razer Chroma lighting and Ethernet is not currently supported for Mac. MacOS High Sierra 10.13.4 doesn't support eGPUs in Windows using Boot Camp or when your Mac is in macOS Recovery or installing system updates. eGPU support in macOS High Sierra 10.13.4 is designed to accelerate Metal, OpenGL, and OpenCL applications that benefit from a powerful eGPU. However, not all applications support eGPU acceleration. Check with the application's developer to learn more. This means eGPUs such as the Razer Core will not power all applications on the internal display and a monitor must be connected to the external graphics card running only your game to reap the benefits of the GPU. The GPU cards listed below have been tested and confirmed to be compatible when using a Core X and a Mac. Can I use Razer Core X with similar NVIDIA® GPU together with the Razer Blade built-in dGPU to produce a single output (SLI)? If you have a higher performance GPU in Razer Core X, you can elect to use that GPU, but the built-in dGPU will be disabled. Setting up you Razer Core - What software and updates do I need for my Razer Core to work with my laptop? If you are using a Razer Blade Stealth 12.5” (2016) - INTEL 6500U Laptop (Model number RZ09-01682-xxxx) please see the FAQ “Required update for using Razer Core and Razer Blade Stealth 12.5” (2016) - INTEL 6500U Laptop”. All other models please proceed as below. Please follow the steps in the order they are listed below. These steps will work for the Razer Core, Core V2 and Core X. Please note: From Windows 10 RS4 update on, you don’t need to install a GPU switcher for the Core to work. If you do not have the latest update a GPU switcher is required. The first step is to make sure your laptop has installed all the latest updates to its OS. So please ensure you have checked for updates and installed any recommended updates. Next install your chosen GPU into the Razer Core. 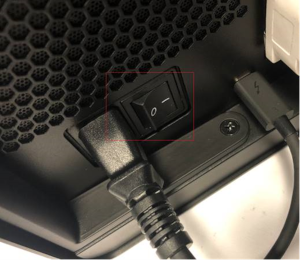 Connect the Core to your laptop using the supplied Thunderbolt 3 cable and turn on your computer. Turn off your computer and connect the Razer Core to your external monitor using the display port on your graphics card. Turn on your computer and begin enjoying all the benefits of your Razer Core.